I have been paddling the upper Mt Fork now for 11 years. 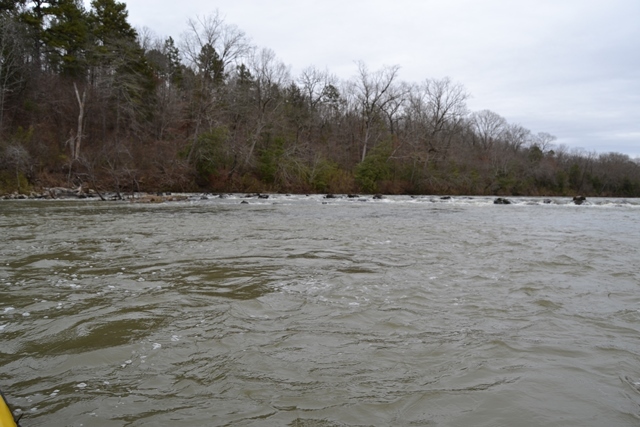 This part of the river sees very few paddlers especially in the winter. I have never seen another paddler on the upper sections of this river. 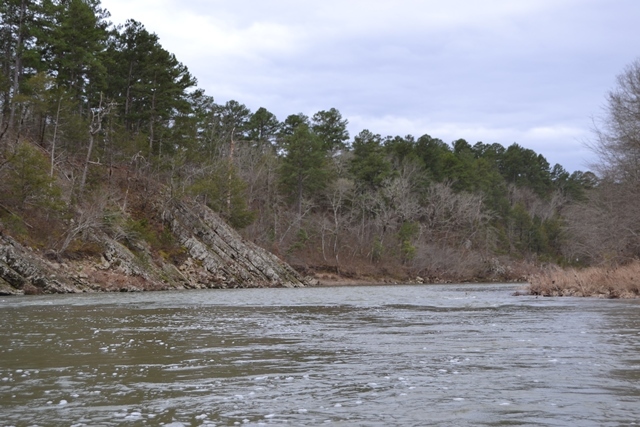 The Mountain Fork River starts in Oklahoma at the base of the Ouachita Mountains about 3 miles west of the Oklahoma Arkansas border and flows east into Arkansas then back into Oklahoma eventually into Broken Bow Lake. 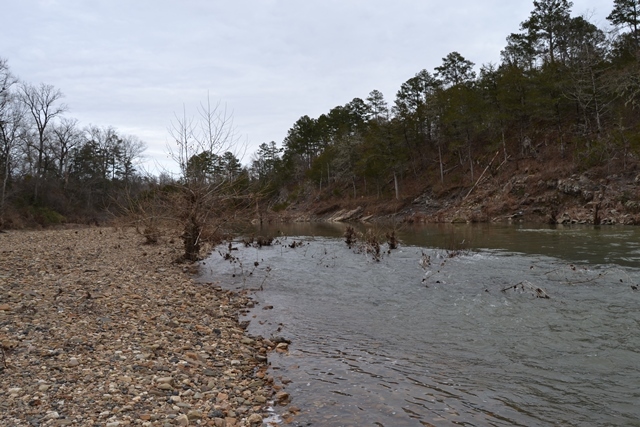 The Kiamichi River also starts within a mile of the same location but higher up on the mountainside and flows to the west. 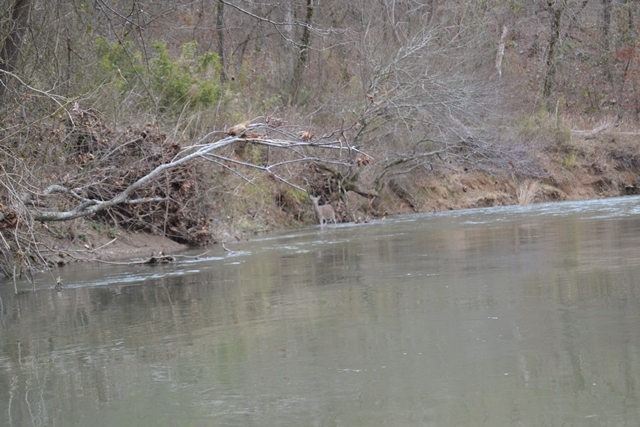 Usually the water flow only allows me to put no higher than Polk County road 48 in Arkansas. However, this year some rain days prior gave me a unique and long desired opportunity to put in much higher to within 3 miles of the start of the river. I put in at Polk Co Rd 95 which is the border of Oklahoma and Arkansas, about 200 yards south of Hwy 8. 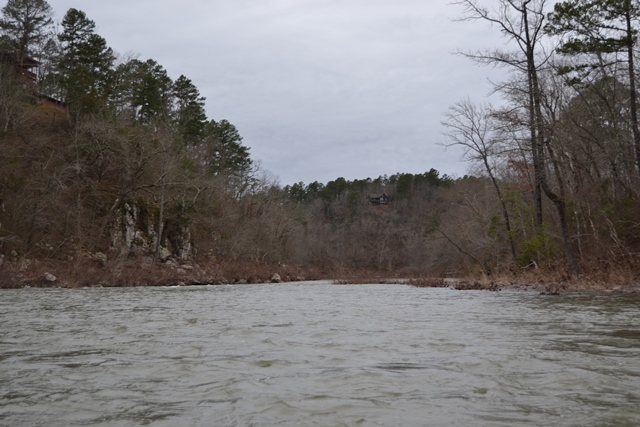 Here the river is only about 15 feet wide and very rocky. The water level was not as high as I wanted but I made a go of it with a temp of 24 and clear skies. My wife dropped me off and I told her it might be dark before I arrive back at the cabins we were staying in called Rivers Edge about 30 miles downstream. Within 200 feet of my put in I was already out walking the kayak over some rocks. The river was more of a ditch in places with a width of 4 feet and dragging the bottom every 30 feet for the first 4.5 miles. The river is running through ranch land with cattle and chicken farms. 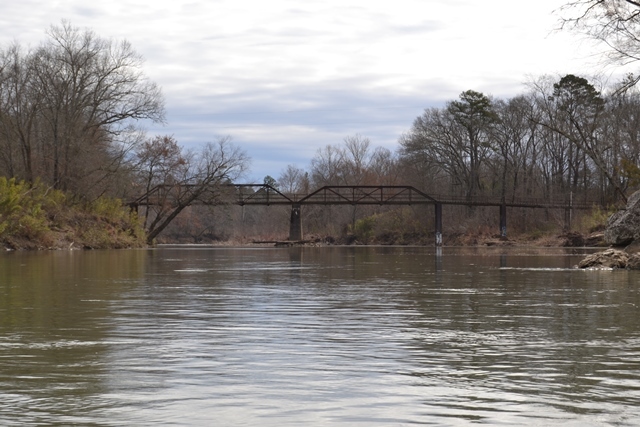 The Paw Lane bridge is about a mile downstream and is a one lane wood bridge. Just past the bridge the river choked down to 4 feet with a hard turn to the right and a large amount of brush and rocks with a nice 20” drop off. I had to get out and push the boat through the brush and line down the drop off and around the sharp turn. In high water this would have been a significant hazard. I was also on the lookout for barb wire crossing the river based on input from a local fellow I met at the put in. The only fence I found was electrified wire hanging down single strands about 4” apart down to the water. I passed through them making contact with a couple but did not take a shock as I had good Gortex top on. After about 5 miles the river became more navigable with only occasional dragging. 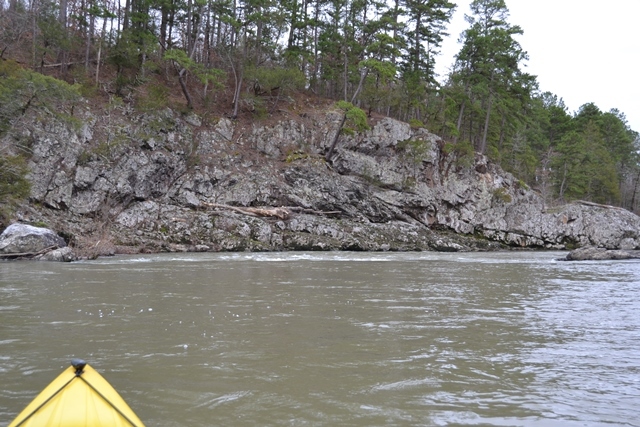 There are a few small rapids and then some bluffs. I passed under the bridge where Co Rd 95 crosses the river a second time and past this the river flows mostly south with several bluffs for another 6 miles to Co Rd 48. Just above this there is an old low water bridge which must be portaged. I chose river right as I had scouted this many times in the past and again that morning on our way up. The total mileage from my put in down to Co Rd 48 was 11.0 miles and took me 2:40 hours with 6-8 portages or getting out to drag. By now the skies were cloudy and temp seemed to be dropping some. There were many icicles along the river from seepages and splash on the brush which did not melt all day. 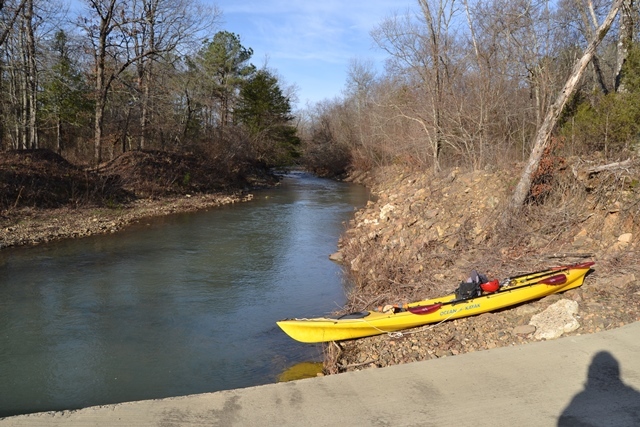 Once past Co Rd 48 I am now paddling familiar water but knew I needed to make up time or be paddling in the dark. So no breaks and paddle hard was the drill. 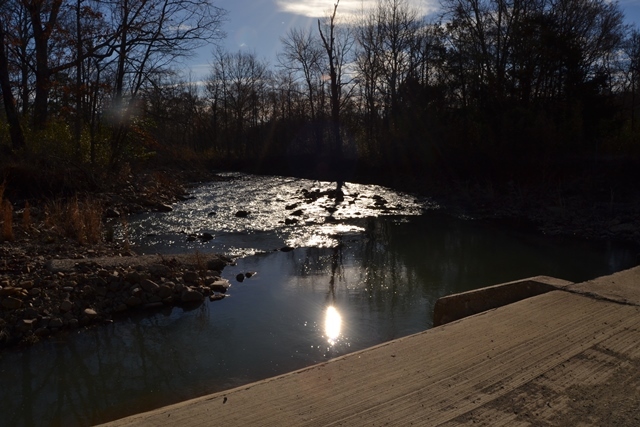 About 4 miles downstream is the Boy Scout Camp Pioneer on river left and also a weir dam. At low water you must portage and is best done on river right. However, at higher water you can sneak down on river left up against the bluff and the dam there is a slope down into the pool below. The pool is turbulent and tries to pull you back into the wash coming over the dam so you must be ready to stroke to the middle of the pull only to find strong eddies in a swirl. Push right to the river and into a little fast water push away from the dam. From here the Co Rd 38 bridge is about 1.5 miles followed by the Hwy 246 bridge. Past the 246 bridge there are several nice gravel bars to stop for lunch or camp. I took a 10 minute break for half a tuna sandwich, a candy bar a few swigs of water and back on the river. I had made up about an hour and half on my time but still needed to make up some more. A combination of faster water and paddling I did just that. The next obstacle is the low water bridge at Beachton Road about 8 miles down. The best portage is on river right and really not issue I arrived at 3pm. The next 4 miles section river is one of the most scenic and also begins to flow a little faster with several drop offs and class 1-2 rapids with some nice wave trains. 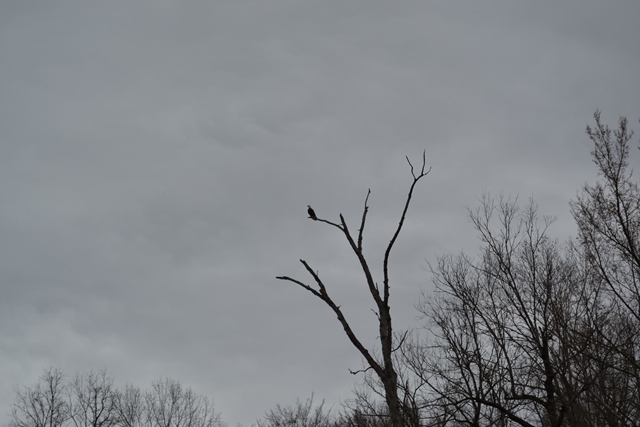 There were several bald eagles working sections of the river and I saw several small groups of deer and one crossing the river. 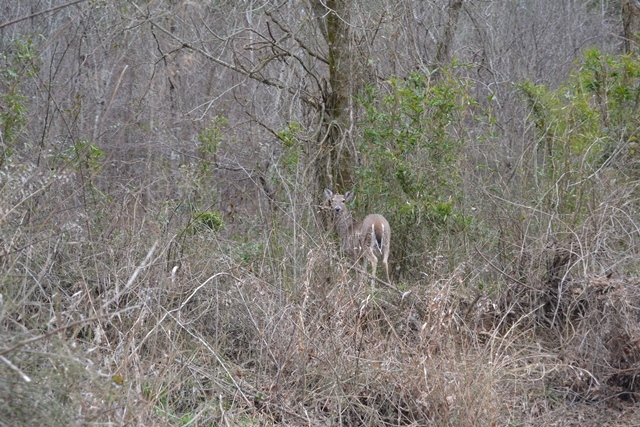 She did not seem too worried with my presence and allowed me to get within 50-70 feet. I made the cabins by 3:40 with cloudy skies with temp of 34 for a total distance for a beautiful 32 mile day paddle. I walked up to the cabin got the truck then drove down to get the kayak. As soon as I got back up to the cabin the rain that was forecast began to set in, what timing. Here are a few pictures and my tracking positions down my trip. Earl, I used to deer hunt and fish Mtn. Fork around OLD Hochatown before the Lake was built. My fondest childhood memories were made there. There is still a can opener nailed to a tree somewhere in about 70ft of water that I left there deer hunting. Thanks for reviving those memories!